Bali has so many different areas, and when you first get to this beautiful island it can be pretty confusing. South Bali is the most Touristic Area in Bali. This means also, that it offers the best infrastructures, the most restaurants and definitely the best nightlife. This is the main city of Bali and still, there is nothing to do here. You will arrive on the Ngurah Rai International Airpot, but if you ask me, this is the only time you should actually pass time in Denpasar. Well Kuta, this is a longer story. If you read about this place in Bali, you will find so many different “pictures” of how this place really is. I think it depends a lot on what kind of person YOU are. For all the other people, if you are a couple, a group of friends, a family, or alone travellers trust me, this is NOT your place to be. Seminyak is only 5 km north of Kuta. Everyone who want to directly go on reading should open their eyes, because Seminyak is NOTHING like Kuta. 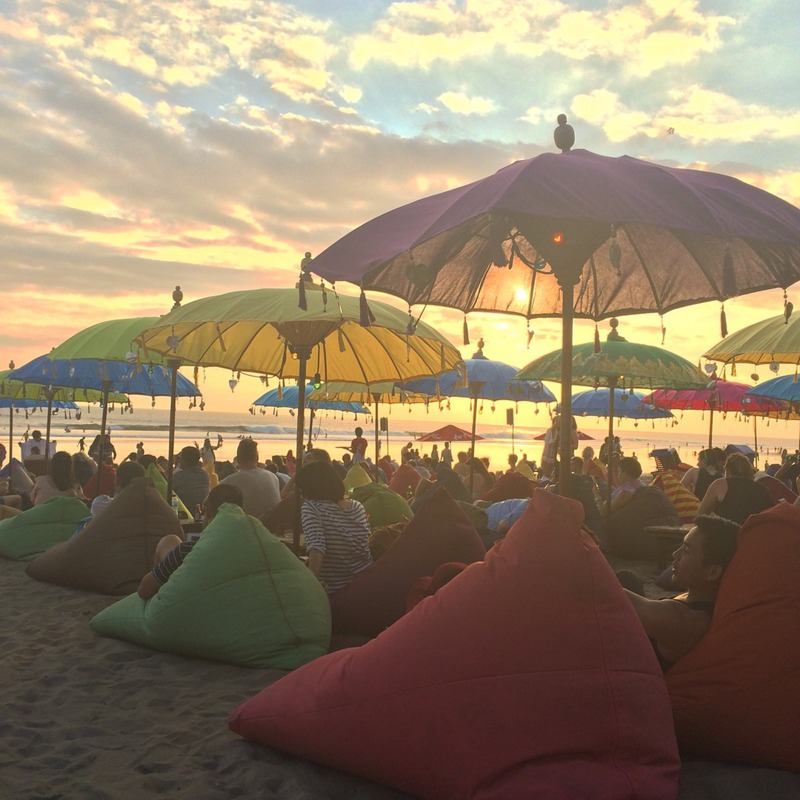 Seminyak has still a lot of nightlife to offer in its different areas, but this is so far away from what Kuta has to offer. This place is perfect if you want to have a beautiful beach and a beginner surfing lesson, a lot of restaurants to choose from, some shopping possibilities and a lot of nightlife. You will for sure meet some people, have delicious meals and be a pro surfer within a weekend. The best street to stay at is … called. All the clubs are quite far away, but trust me you shouldn’t go and have a hotel up next to the clubs, because beside rich villas and the clubs there is absolutely nothing. You can find everything that you need to know about Seminyak here. Legian is situated in between Kuta and Seminyak. 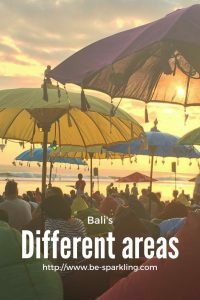 As you have seen those two places are quite different and Legian offers what it promises: a bit of both. You are close to the “party avenue” of Kuta and have a short walk to the center of Seminyak. For Restaurants Legian seems to have a good offer and if you search for some shopping possibilities under the european prices this might help your portfolio out. This place is just south of Kuta and is the first village on the half Island. Everyone talks good about Jimbaran, but I just don’t know why. It is a tiny town, that offers absolutely nothing. The fish is probably one of the best on the island, that you can have in one of the restaurants at the beach. But be prepared to not have a lot of decisions to make. Everything works through pre-fixed menus with a high price. The Beach is quite nice, but compared with the others on the Island, not worth a visit. Situated south of Kuta on the east coast of the half island. This is the area where all the “beautiful and rich” go to spend their holidays. The area is nice, the beach is beautiful, but to have dinner here in one of the hotel restaurant will cost you likely a monthly salary. Sanur is south east of the island and is probably after Kuta/Seminyak the other more touristic area. Nice beaches and good small restaurants and bars to enjoy a drink at the beach. This is definitely a place you can rest for some days. This is the point all in the south of Bali. All the best surfers come here, so if you want to get tanned, while meeting some good-looking Australian surfer, this is probably the best place. The waves are high and there are dramatic cliffs all around. For surfer beginners, this is nothing you should play with ! Go to the Single Fin bar best on a Sunday evening to sea one of the most beautiful sunsets of the island. This is probably the less touristic area that you can find. If you are searching for white beaches, palms, crystal clear water and no person around you, this is the place ! But be aware, that on the island there are no cars general cars are allowed to drive, so try to set up a pick-up with a pre-booked hotel. TO get to the island the easiest way is to take a boat from Sanur. You have speed and slower boats and if you are not in a hurry I would recommend to take the slower ones, so that you can enjoy the ride and the view of Bali and the island. Central Bali is the hearth of Bali’s art. This area is predominantly around Ubud. Ubud is my personal favourite place of Bali. This place makes the time stand still and gives you the right air to breath. If you are searching for a relaxing place and some culture or adventure, then you should definitely not miss out on Ubud. Read my full post about this city here. Lake Batur is about 40min ride from Ubud by car. Here you can also see the volcano of the island. It is a very beautiful land scape and there is a restaurant, that offers you the best view of both. Unfortunately the food is not the best, so try to only step by for a cup of tea. This is one of the most know art villages south of Ubud. Here you can find any type of jewellery made out of silver and gold. Another one of the beautiful art villages around Ubud. This is the hearth of mask of any kind. These are mostly created for dance or other performances. The West of Bali is not as visited than any other part of Bali, so if you want to sea Bali without any of the other tourists, this is the area to choose. This Area also includes the Bali Barat National Park, that shows a preserved wildlife of Bali. The east of Bali is less touristic than the south and offers beautiful, long beaches to relax and getting tanned. There is no surfer paradise on the east coast though, and the waves are smoother than on the other parts of the island. The area is filled with mountains and here you can find Bali’s Holy mountain, the highest mountain of the island. Also many temples are located in this area and are worth a visit. The north is less hectic than the southern part of the island and offers beautiful black sand beaches like the Lovina beach. Mostly attractive is this area for its coral reefs. If you have any questions, just leave me a comment !